Some people design their pages to be sewn together in a permanent book, while others add grommets to their pages and make books with interchangeable pages (like a binder.) I design all my pages to be interchangeable because I feel the book holds my daughter's interest longer when the pages are constantly changing. I also really enjoy designing and including seasonal pages in our quiet book. What makes a good Quiet Book? Quiet books can be beautiful, hand-sewn masterpieces or simple, glued-together pages. The success of a quiet book is best measured by the intended child. Quiet books should be fun, hold a child's interest, and be directed toward their individual skill levels. When designing new pages, I try to think of new ideas that are just a step outside my daughter's current skill level or that introduce new skills, while keeping her interests in mind. If she's entertained and having fun then the page is a success … it doesn't have to be picture perfect! If you are using acrylic craft felt (or eco-felt) be careful with the iron! You can iron it (i.e. when using freezer paper) but it will melt if it gets too hot so don't leave your iron in one place for long. Save your felt scraps! I save all my felt and thread scraps in a large bag and use them as stuffing for softies or for art projects with my daughter. Have fun and be prepared to spend all your free time making pages and brainstorming ideas. Not only do they take quite a bit of time to make, quiet book pages become very addicting so you won't want to stop! Felt – I recommend stocking up on the basic colors if you plan to make a whole book. Felt comes in acrylic, blended wool, and 100% wool. Acrylic sheets are the cheapest but any felt will work. I use all 3 and choose depending on my project. Thread – I use a single strand of embroidery thread, folded over and threaded through the needle (so it forms a loop at the end, similar to the method in the first half of this post.) I like embroidery thread the best and think it looks the nicest. You can also use regular sewing machine thread, if you already have a lot of colors and don't want to buy more supplies. Scissors – As I mentioned in the tips above, sharp scissors will give you the best results. These micro-tip scissors are my favorite for cutting precise lines and small pieces. Freezer paper – Freezer paper is a HUGE time-saver. I cut mine to printer paper size and print my patterns directly onto the freezer paper. It's also see-through enough to use as tracing paper, if you would rather trace the patterns. See my post on using freezer paper to cut felt for more info. Felt Glue – (optional) – This felt glue is great! I use it occasionally when I am working with small pieces and I don't want to (or can't) use pins/clips. You can also glue your pieces for no-sew options of most quiet book patterns. Eyelets/Grommets – (optional) – If you would like to make a book with interchangeable pages, these work great to create reinforced holes in your pages. I have this kit and love it. Sewing machine – (optional) – I use a sewing machine to finish (sew the backing on) my pages. If you are more comfortable with a sewing machine than hand-sewing, you can also use a machine to sew your little pieces. Embellishments – Buttons, ribbon, snaps, lace, shoelaces (for lacing activities), small magnets, beads, velcro, etc. are all great to have around or pull from your “stash” to create different activities or sensory experiences in your pages. Just a few of the quiet book pages I have sewn. See links in the resources listed below for more examples. 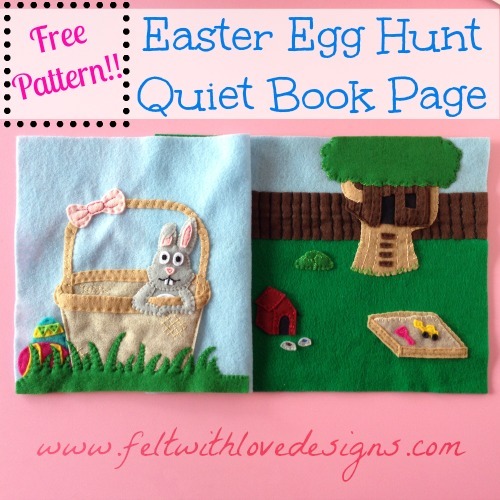 Felt With Love Designs Quiet Book Archive – All of our latest designs! Felt With Love Designs Finger Puppet Archive – Finger puppets are great inspiration for quiet book pages and also a great addition to a page. 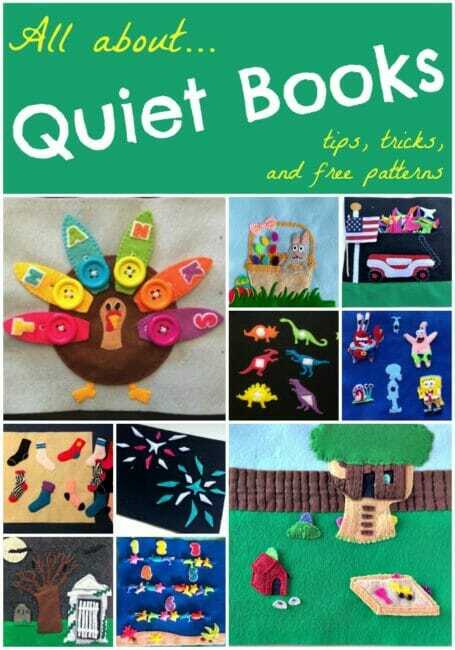 Free Quiet Book Patterns Pinterest Board – I pin only free patterns for both full books and for individual quiet book pages to this board. Lots of great ideas! Quiet Book Page Ideas Board – A place where I pin all of the fun ideas I see for quiet books. Some are free patterns, some are inspiration only. 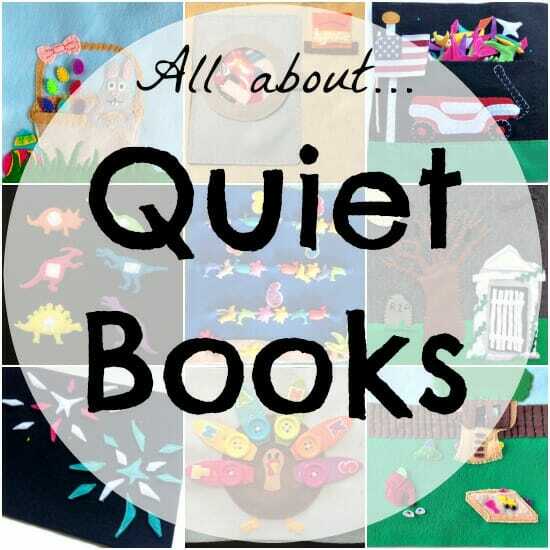 The Quiet Book Blog – Jocelyn regularly hosts new quiet books in her blog and maintains an excellent directory of free quiet book templates. Imagine Our Life – Stephanie makes some of the most exquisite quiet book pages I've seen. I love her combination of creativity and educational resources. Plus, she releases almost all her patterns for free! 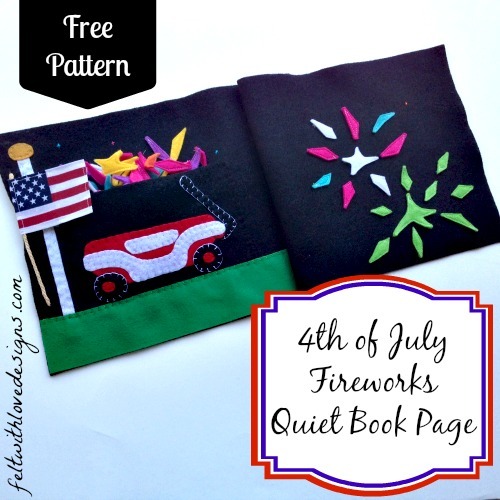 And Next Comes L – Dyan also has a fun, educational collection of free quiet book page patterns. I love her letter pages! If you have any questions about quiet book pages or anything you would like to share that I may have forgotten to mention, stop by the Felt With Love Designs Facebook page and get in touch! I would love to hear from you! Hi! I'm Alicia from Felt With Love Designs where my husband, Patrick, and I write about all of our crafty and artistic endeavors. Patrick is the artist behind our designs. I create all our patterns and designs based on his sketches and bring them to life with a needle and thread. 27 Responses to What is a Quiet Book? I made one for my daughter about 55 years ago to entertain her on a trip. The books weren’t a “thing” then, I just had this idea. I did machine applique with a regular sewing machine. (I now have an embroidery machine). I know we kept it somewhere, but I don’t know where. You know it would be gold and an honor if you found it and I could show it in this post. You were perhaps the original creator of this item. I love quiet books for children – I made one of animals on a farm and my great nephew loves it. These are so practical and the felt is just great to use for the removable animals and stimulates the children. Is the felt washable? When I make children’s items I like to be able to wash them if they get dirty. Thanks! Yes you can wash felt in cold water. Where can I obtain textured felt like what is used on the dump truck page for the dirt? HI Joy, Art supplies shops are the best source. Thanks for all your ideas. I have everything cut out and am ready to start sewing, but I can’t get my machine to sew the felt.I asked my local quilting store and she told me that I needed a special needle and silk thread. What are your thoughts? I think a lot of the sewing in quiet books is by hand as you will see in these projects but as Alicia mentions in the post, she uses a sewing machine to finish the pages. I can’t imagine you’d need to use anything different than regular sewing machine thread. What seems to be the issue when you try to use your machine? Thanks for your reply sorry it took me so long to get back. I figured out that my needle was bent everything is great now! Do you sew the objects to the page, if so then do you sew the whole page onto another page?for example if i sew everything onto the page, then the stiches would show in the back..
Hi Hilda, all the pages are doubled so no stitches will be showing at all. 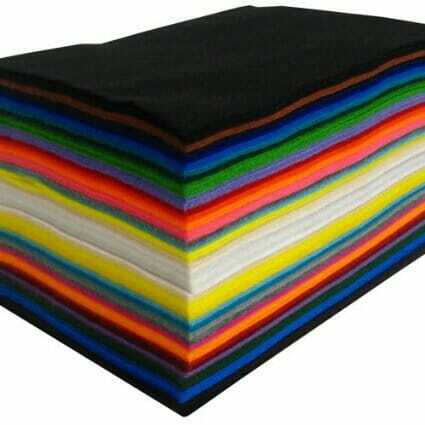 It’s difficult coming across good quality felt in my country. Would velvet be a good substitute for making the activities? A velvet might work as well. Hi Eve, I’m not really sure what you have available in your country but you’ll need a heavy fabric like a wool serge, velvet or something like that. Really depends on what you have available. As you suggest, cotton is probably too light. How about, after you sew or glue or iron-fuse the design on the cotton fabric, back it with heavy interfacing, then sew it back to back with another such page? Or a lighter interfacing (or embroidery stabilizer) to give each page some stiffness, plus a layer of cotton batting between the pages? Amazing! Wonderful! 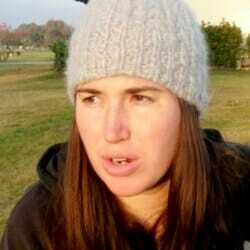 Soooo great and lovedall of it! Sooo creative! I love this idea. I will become a grandma soon and already have many ideas. 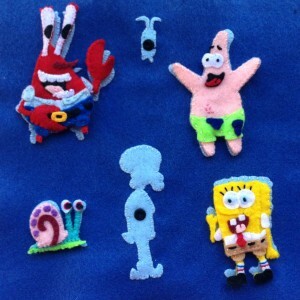 Working with felt is entertaining, easy enough, and inexpensive. Thanks for all the lovely ideas. can i use muslin sheets for pages? I don’t think that would be sturdy enough febe, it should really all be made of felt. You can use any fabric for your pages, just sew the whole thing onto extra heavy weight pellon, available in sewing stores by the inner facing fabric. I’ve been making quiet books since the 80’s and find that the extra stiffness makes them very sturdy. Good luck! How big do you make your book? I am loving these ideas but not sure how big the pages are. I will probably do one that I can interchange pages (cause that also looks like it would be easier than binding individual books) Thanks!! I cant wait to get started! Love Quiet Books. Made one for my daughter when she was young, and it is now at her home for her children. Made a second one to keep at our home for when the grkids visit. I love the idea of the quiet books. Very practical and resourceful !